The sports nutrition market really took off in the mid-90's. However, other than product labels and manufacturers' web sites, objective information on these products is not readily available to the consumer. In this discussion, I'll review some practical aspects of energy bars. Energy gels and sports drinks are covered in separate reviews (see Articles). Readers are also referred to our Energy Bars Comparison Tool for detailed information on specific products. Before going any further, I need to point out that the "categories" of energy bars presented here (or, in any other publication, for that matter...) are not "official" or "standardized." The FDA does not have official definitions of any of these terms. Having said that, the following categories are used frequently by sports nutritionists such as Liz Applegate, PhD (UC Davis) and Jennifer Neily, MS, RD (Cooper Clinic), and are also the categories used in an analysis of these products by ConsumerLab.com. The terms "nutrition" bars and "energy" bars overlap. Both of these terms could be applied to any of the 4 types listed above. But, "energy" bars are best represented by the high-carbohydrate bars. I'll expand on these definitions below. Jennifer Neily, MS, RD, at the Cooper Clinic classifies a nutrition bar as "high carbohydrate" when carbs provide at least 60-70% of the calories. In our Energy Bars Comparison Tool, we use 70% or higher as the cut-off for defining a "high-carbohydrate" bar. Also, Neily refers to these bars as "performance" bars, but I feel the label "high-carbohydrate" is more descriptive, and that's what I will use in this discussion. High-carbohydrate bars are the prototype "energy" bar because carbs are the main fuel needed during strenuous activity. In addition to providing rapidly-absorbed carbs, high-carbohydrate bars are also lower in protein, fat, and fiber than other types of nutrition bars. 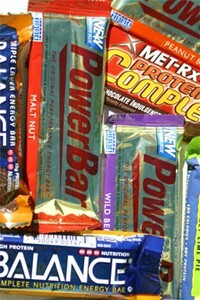 PowerBars® are a good example: they contain 45 g carbohydrate, 9-10 g protein, and 2-3 g fiber. Clif® Bars contain roughly similar amounts of carbs and protein as PowerBars®, but have slightly more fiber. Protein bars, as the name obviously implies, offer more protein than the carbohydrate bars. Sports nutritionists typically consider bars with 15 g protein or more per bar to be a "protein" bar. Again, this cut-off is not officially recognized by the FDA. Protein bars contain variable amounts of carbohydrate. Some manufacturers label these bars "low carb", but this designation is also not formally recognized by the FDA. Since there is no consistency to how manufacturers use this term, it is meaningless. Bars in this category contain less than 200 calories per bar. That's not much. Keep in mind that a 12-oz. serving of beer or non-diet cola contains roughly 140 calories, and an average banana is roughly 100 calories. But don't call these bars "low calorie." Although the term "low calorie" is used in everyday conversation, this is one term that does carry a specific definition in the food industry: For a food product to qualify as "low-calorie," it cannot contain more than 40 calories per serving, and not more than 0.4 kcal per gram (Levine AS, et al. 1985). While some bars (eg., Clif Bar's Luna®) have a lot less calories than other brands, none truly can be called "low calorie." Even the term "reduced calorie" cannot be applied. The FDA defines "reduced calorie" foods as having at least a one-third reduction in calories compared with the regular food. So, unless a manufacturer makes 2 versions of a particular brand of energy bar, the phrase "reduced calorie" cannot be applied. So, we are left without a proper name for the group of energy bars that have fewer calories than others. Applegate uses the term "women's-only" bars for products that contain less than 200 calories. Neily describes "women's bars" as having other ingredients that women need, such as calcium, folic acid, iron, and soy protein. We'll use the term "lower-calorie" bars for these bars since that term is self-explanatory. Generally, endurance athletes are not going to use these bars much since they don't offer enough calories and because ingredients such as iron might cause GI distress if you consume them during training or competition. Most nutritionists dislike the term "meal-replacement" because it is misleading; none of these bars can replace a properly-balanced meal. A better name for them might be "balanced nutrition" bars, but because this label might cause confusion with the brand known as "Balance® Bar," I have chosen, for now, to use the term "meal replacement" bars. Meal-replacement bars usually contain more calories than the other types discussed here, and typically offer a more balanced supply of carbs, fats, and protein. For example, Balance® Bar and PR Bar are both based on the 40/30/30 ratio of carbs/fats/protein. Meal-replacement bars also contain a wider variety of ingredients than high-carbohydrate bars, such as fiber, vitamins, and minerals. These ingredients are not needed during exercise, according to Applegate. Therefore, they should not be consumed just prior to, or during, an aerobic event like distance running. Also, aerobic athletes require a diet that provides at least 60% of calories as carbs; 40% is too low. They are, however, good choices between work-outs or for activities such as hiking, back-packing, skiing, etc. that are not as aerobically intense as running. Unfortunately, neither the FDA nor the USDA do any quality-testing of nutrition bars prior to their marketing. The supplement-testing group ConsumerLab.com analyzed 30 brands of energy bars purchased during April and May of 2001. They found that 60% failed to meet their labeling claims. The products with the highest failure rate were protein bars (only 1 out of 12 passed) and meal-replacement bars (only 1 out of 8 passed). The 2 most common problems they found were underreporting the amount of carbohydrates and sodium contained in the product. In other words, many nutrition bars contained more carbs and sodium than what was stated on the label. Regarding the underreporting of carbohydrates, some manufacturers excluded glycerin from the calculation, despite the fact that the FDA requires that glycerin be included as a carbohydrate. In July 2000, the FDA sent letters to some manufacturers regarding the inappropriate use of the statement "low-carb," and the exclusion of glycerin in the calculation of carbohydrate amount, however, this problem appeared again with a high-protein bar in a clinical study conducted during 2002 (Hertzler SR, et al. 2003). So, some of the problems described here may still exist. ConsumerLab re-evaluated nutrition bars again in January 2005. (see results at: www.ConsumerLab.com). Nutrition bars from different manufacturers encompass a broad range of calories. For example, Ironman PR Bars contain almost 500 calories per bar, while Clif Bars' Luna® Bars contain only 170 calories. Also note that food manufacturers are required to round up or down to the nearest unit of 10 when reporting calories. So, if a product contains 216 calories, it will be reported as 220. Because of pressure to remove trans fats, some manufacturers are replacing these partially-hydrogenated oils with palm oil. Unfortunately, palm oil contains nearly as much saturated fat as butter. The National Heart, Lung, and Blood Institute, and the World Health Organization recommend limiting the consumption of this oil because of the relationship between saturated fats and heart disease. The Center for Science in the Public Interest (CSPI) adds that the cultivation of palm trees for palm oil destroys rain forests (see their report "Cruel Oil" at www.CSPInet.org). Further, some research shows that a diet high in palmitic acid, the primary saturated fat in palm oil, has detrimental effects on energy expenditure and thus may enhance weight gain (Kien CL, et al. 2005). Allergic reactions to peanuts can be fatal in people who are susceptible. Even if the product does not contain peanuts, look in the Ingredients list for "peanut oil," or for the phrase "made on equipment that also processes peanuts." Peanut oil, depending on how it is produced, may or may not invoke a reaction in people who are allergic (Sampson HA. 2002). According to Liz Applegate, PhD, it is important to look for high-quality sources of protein such as whey, soy, caseine, or egg. Whey comprises 20% of the protein in milk; the other 80% comes from caseine. Whey is digested and absorbed more rapidly than caseine. In addition, whey is a good source of branched-chain amino acids (BCAAs) such as leucine, isoleucine, and valine. BCAAs, in turn, are taken up by skeletal muscle directly, bypassing the liver. Fructose-enhanced corn syrup (aka: high-fructose corn syrup, HFCS) is a widely used sweetener in processed food products, including nutrition bars. However, fructose may cause GI intolerance in some athletes and is being blamed as one of the major reasons for the obesity epidemic in the US (Morrill AC, et al. 2004). So, for these reasons, should athletes avoid energy bars that contain HFCS? It depends. Even when HFCS is listed on the label (if the product contains it), the amount is not. This makes it impossible to determine how much you are consuming. So, for athletes who consume a lot of energy bars, products that do not contain HFCS should be your first choice. "Trans fats" is the chemical name for "partially-hydrogenated" oils. Thanks to TV commercials, consumers are hearing more about trans fats. These artificially-modified oils are used by food manufacturers to prolong the shelf life of their products. Unfortunately, while the use of partially-hydrogenated oils is beneficial for food manufacturers, it has created a health risk for consumers. The general opinion in the medical community is that trans fats contribute to atherosclerosis, and, may even be worse than saturated fats. On January 1, 2006, all food manufacturers were required to list on the label the amount of trans fat in their products. This is an improvement, but consumers should note that any product that contains less than 0.5 grams of trans fat can be labeled "zero trans fat." So, if you eat lots of bars, you may still be getting too much trans fat in your diet. General nutrition recommendations suggest that the daily intake of trans + saturated fat not exceed a combined total of 20 g per day. Clif Bars® and Probars® are brands of energy bars that do not contain trans fats. Nearly all processed food products these days are fortified with vitamins and minerals. How can this be a bad thing?, you ask. Some athletes eat a lot of energy bars. For example, Tour de France cyclists may consume 5 or more bars per day every day during the race. At this rate, these athletes can exceed the recommended amounts for some of these nutrients, especially if the bar contains a large quantity of it. In 2001, Metabolife recalled their Diet & Energy Bars because they contained too much vitamin A: 32,500 IU per bar. That's a lot. Vitamin A is stored in the liver and consuming too much of it can lead to health problems. Excessive consumption of some minerals can also cause problems. Too much zinc can cause GI upset and too much iron or potassium can lead to serious medical issues. Thus, if you routinely use bars in place of meals, limit your choices to products that have the lowest amounts of these vitamins and minerals. Generally, you don't want to consume lots of protein, fat, fiber, or minerals just prior to a race. These ingredients are harder to digest and/or may cause stomach cramps. So, avoid meal-replacement bars and high-protein bars. The best choice prior to, or during, an event are the high-carbohydrate bars, such as the original PowerBar®. PowerBars® contain a high percentage of calories as carbohydrates, but, note that they also use high-fructose corn syrup as a sweetener. Almost every athlete and coach knows that muscle glycogen is greatly depleted during prolonged endurance exercise (eg., triathlon, distance running, tennis match, century ride, etc). Extensive research has shown that ingesting carbohydrates during endurance exercise can improve performance (Nikolopolous V, et al. 2004) (Utter AC, et al. 2002). Thus, high-carbohydrate bars are the best type to consume just prior to, or during, a prolonged aerobic event. The best choices are bars that offer at least 25 grams of carbohydrate, less than 12 grams of protein, and little or no fiber. During a race, however, it is a lot easier to quickly gulp down something in liquid form, as opposed to trying to chew-up a gooey energy bar while you are breathing heavily. For this reason, energy gels have become the preferred method of ingesting carbs while running. After the race, you need to replenish muscle glycogen. Restoring muscle glycogen back to pre-race levels may require 24-48 hrs, depending on your level of fitness. Here, high glycemic-index carbs are recommended (Siu PM, et al. 2004). So, a bar like PowerBar® is a good choice (Hertzler SR, et al. 2003). Also, consider a bar that contains some protein, as the addition of a little protein to a carb load improves glycogen storage and hastens recovery. Walking or hiking or skiing, or any activity that is not as aerobically intense as running, allows for the consumption of bars with other ingredients. For example, the ProBar contains berries, nuts, and fiber and would be a good choice to carry on an extended hike. In August 2005, Clif Bars began marketing Clif Shot Blok. These are small, rapidly-dissolving cubes of pure carbs: 3 cubes contain 24 g carbs, 0 fat, 0 protein, and 100 calories. • Sport Beans(tm): The Jelly Belly Candy Co. is now marketing Sport Beans(tm). Each packet contains 14 pieces which provide 100 calories as carbs. The carb source is "sugar and corn syrup." • Natural Foods: Also, note that some natural foods have been shown to be just as effective as energy bars for sustaining athletic performance: bananas, honey, raisins, and prunes have all been used. Honey appears to offer the same benefit as high-carbohydrate bars. Even though honey is incredibly sweet, the glycemic index (GI) of honey is only 35. When honey and dextrose (GI = 100) were compared in cyclists, the performance during a 64-km time trial was nearly identical. Cyclists ingested 15 g of the carbohydrate every 16-km in this study (Earnest CP, et al. 2004). Q: Post-race consumption of protein is now recommended for optimum recovery. Can I use a high-protein bar for this? ANSWER: The consumption of protein immediately after strenuous exercise has been shown to be beneficial. But, this research was based on sports drinks that contain a carb:protein ratio of 4:1 (eg., Accelerade®). The carb:protein ratio in high-protein bars is a lot higher than 4:1, so, it wouldn't be logical to assume a high-protein bar would be interchangeable with a protein-containing sports drink. However, if you combine enough carbs with a high protein bar to produce a final ratio of 4 parts carbs to 1 part protein, you should achieve the same result. Note that Clif® Bars and PowerBars® provide a carb:protein ratio of approximately 4:1. Q: What are "impact" carbs? ANSWER: This is a meaningless term as far as the FDA is concerned. Food manufacturers sometimes use this term to differentiate "major" sources of carbohydrate calories (ie., impact carbs) from minor sources, such as glycerin, mannitol, and sorbitol. • If you use energy bars during competition, look for products that contain 70% or more of the calories as carbohydrates. Avoid bars that contain lots of fiber or fat, or minerals such as zinc and iron; large amounts of these ingredients in your stomach during competition may lead to GI distress. • Don't experiment with a product you have never eaten just before a major race. Develop your sports nutrition plan prior to race day. • Drink plenty of water with each energy bar. Remember, dehydration can hurt performance, too, and energy bars won't solve that problem. • Energy bars are relatively expensive, especially if you consume them regularly. Consider trying bananas, raisins, honey, and other foods. • Some energy bars are sweetened with high-fructose corn syrup (HFCS). Avoid these brands if they give you stomach cramps or if you eat a lot of bars on a regular basis. An excellent sports nutrition book for athletes is Sports Nutrition Guidebook by Nancy Clark, MS, RD (Human Kinetics, 2003, $18.95) and Food For Fitness - Eat Right To Train Right by Chris Carmichael (G.P. Putnam, 2004, $25.95). Both of these books provide brief information on energy bars. The best web site for information on glycemic index and glycemic load is www.GlycemicIndex.com, maintained by the University of Sydney. Unfortunately, the glycemic index value for most energy bars has not yet been determined. Readers are encouraged to use our Energy Bars Comparison Tool to obtain detailed information on over 100 specific products. DISCLOSURE: Neither the author, nor AthleteInMe, LLC, has any financial relationships with any of the companies or products mentioned in this review.